For private groups of eight to twenty-four golfers, the one-of-a-kind Four Seasons Golf School provides an exceptional three-day program based on the expertise of a true master of the game. Inspired by a long-time relationship with the late Byron Nelson, the golf instruction staff has created the golf school to offer a unique teaching approach with unmatched facilities. Although the program is offered in a group setting, instructors tailor their training to support golfers of all skill levels. Providing an exceptional golf experience in a luxurious environment, the Four Seasons Golf School offers an excellent opportunity for hosts to spend quality time with clients or colleagues - ideal for building teams and strengthening relationships. For more information and reservations, please contact the Golf School Sales Manager at 972-717-2520. "The Four Seasons Golf School is one event that everyone looks forward to, year after year. We conduct numerous events each year, looking to deliver quality customer interaction, exceptional service and memorable experiences. The Four Seasons Golf School is the one that we can be certain will achieve all of these objectives, without fail. Tim Cusick and his staff of instructors are the best in the business at making any golfer, at any level, feel more comfortable with their game. The instructors are there with a single goal in mind - to make your time on the golf course more enjoyable. 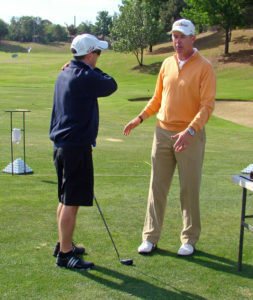 "I had the opportunity to spend a few days with other executives at the Four Seasons Golf School. It was an amazing experience - my golf game improved a lot - and I built relationships that will last a lifetime both professionally and personally." "The Four Seasons Golf School was an incredible experience of outstanding instruction, wonderful accommodations and absolutely superb food and drinks! Our clients raved about the Four Seasons' service and this unbelievable first class golf experience. There is no golf school in the country that offers this level of quality nor offers this caliber of relationship building with the clients." "I have had the pleasure of experiencing many fine golf courses and school/facilities in my forty years of playing golf. None have been as extraordinary as the school at the Four Seasons Resort and Club/Las Colinas. The level of personal attention, quality of instruction and service that Tim Cusick and his staff deliver is unmatched. level of professionalism and commitment to excellence from Tim and his team ensure that each and every golf school will be unsurpassed by any other customer event." School, you're already thinking of your next trip back." "Our company has hosted more than fifteen golf schools at the Four Seasons Resort and Club/Las Colinas over the last decade. This is the premier venue and program in which to entertain key supply chain partners." "As the Chief Marketing Officer of Sabre Holdings, I am intimately aware of the value of customer events. Some provide good experiences, some provide quality interaction time and some provide good service. Of all the events we sponsor for our customers, none even comes close to providing the outstanding service spectacular experience and sustaining memories for our customers to that of the Four Seasons Golf School. Tim Cusick and his team are the best in the business and the facilities at the Four Seasons are wonderful. I would recommend the golf school for any group looking to build a strong bond with their customers as well as have one of the most special experiences in golf!" To learn more, contact the Golf School Sales Manager at 972-717-2520.